Astute e-bike fans might remember the name BRD, the group setting out to make an electric motocross (and supermoto) competitor from the ground up, called the Redshift, with an emphasis on performance. As we found out at the AIMExpo recently, 2015 brings the bike and the company a few surprises. For starters, BRD is no more. Presenting those in attendance with a Photoshopped Chef Boyardee logo as some sort of cryptic reason for the name change, the company now goes by Alta Motors, in reference to “Alta California,” the geographic location of its San Francisco, CA headquarters back when the land was under Mexico’s rule. 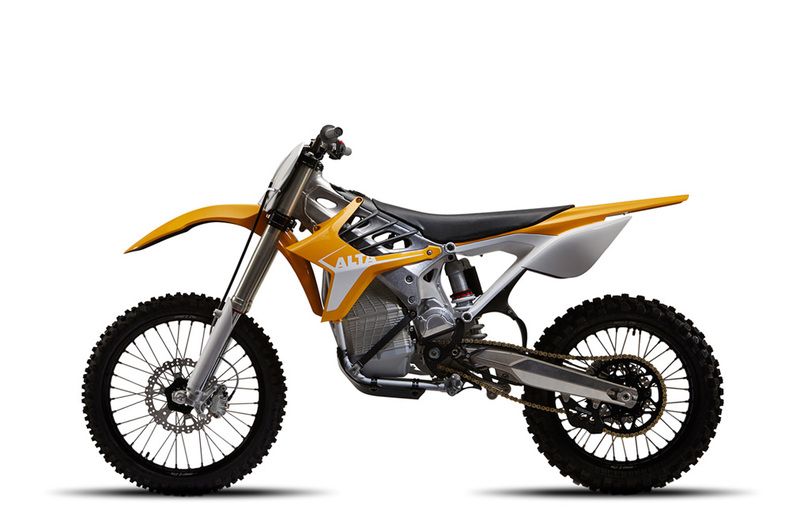 Name changes aside, the Alta Motors Redshift is making waves as a potentially groundbreaking electric motorcycle. It’s designers and engineers never set out for the title of best electric motorcycle, instead setting the bar higher and working towards a machine that could go toe-to-toe with gas bikes in the competition arena. While we have yet to ride the Redshift MX or its street-legal supermoto variant, the bike is nonetheless interesting. 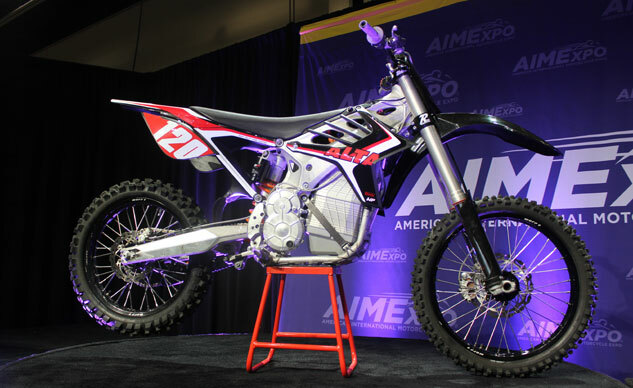 No longer under the BRD moniker, the Alta Motors Redshift MX was designed from the ground up to be a competitive MX2/Lites class motorcycle that happens to run on electrons instead of gasoline. 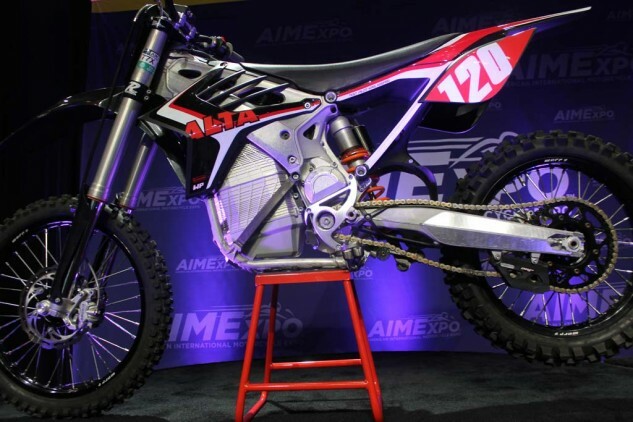 Because of the unique energy profile of MX, Alta believes electrics could actually be a better competition dirtbike. During the initial design of the bike, the team took the common route of starting with a gas bike and modifying it for electricity. In fact, Alta started with a Honda CRF chassis, but quickly realized nothing about it was optimized for using electric power and it was eventually scrapped. By 2012 a two-piece cast frame was designed and produced and became the basis for the Redshift. Sitting inside this prototype frame was a battery and a liquid-cooled motor. Once the test mule was fitted with the necessary suspension pieces, wheels, brakes, controls and running gear, their operating prototype weighed somewhere in the vicinity of 270 lbs., well north of the 250-lb goal. It doesn’t take a genius to tell you excess weight is the enemy of speed, and to stand a chance at competing in the MX2/Lites class, BRD/Alta would have to find a way to put the Redshift on a diet. In response, for the past two years the team went over the bike with a fine-toothed comb, heavily revising the Redshift from the ground up. Alta’s proprietary battery, motor and motor controller rests inside a forged aluminum frame that’s also an in-house design. The complete motorcycle is said to weigh close to 250 lbs and make 40 peak horsepower. For starters, the patent-pending lithium-ion battery is an all-new design, throwing away more than two years of work to make something lighter and more efficient. It now has a 5.2-kWh capacity and weighs about 70 lbs.. Alta says the unit is more efficient than a Tesla battery, and 15 lbs. lighter than its predecessor, which is where the bulk of the 20-lb. weight loss comes from. It’s also swappable, like that on the Zero FX, with the removal of a few bolts and a friend to help lift it out – a process Alta says takes 5-10 minutes. This means you can use up a battery during motos and change the battery out for a fresh unit in between. For reference, an individual FX battery weighs approximately 42lbs., according to our Zero rep, with a max capacity of 2.8 kWh. However, you can add a second unit (for an extra $2495), upping max capacity to 5.7 kWh (nominal capacity, the industry standard, is 2.5 and 5.0 kWh, respectively). Swapping batteries on the Zero is a relatively simple procedure, too, which can be performed by a single person. We’ll have to wait to pass judgement on the Alta system until we get a chance to swap a battery ourselves. Alta says battery recharging takes about four hours from a standard 110v outlet, though you can obviously charge at other charging stations with an adapter and fill up faster. The lack of a fuel tank and what appears to be a relatively compact battery gives the Redshift MX and SM a narrow profile. The Redshift also features a proprietary motor controller and liquid-cooled motor, which is said to produce 25 hp (continuous), 40 hp (peak), and weigh just 11 lbs. The high-speed PMAC motor puts out 30 lb.-ft. of torque. That said, comparing numbers between gas and electrics is an apples and oranges affair. Primary drives affect the actual power reaching the road on both bikes, and torque multiplication factors for each gear on an ICE bike complicate matters even more. This post on the Alta website explains these issues in greater detail. 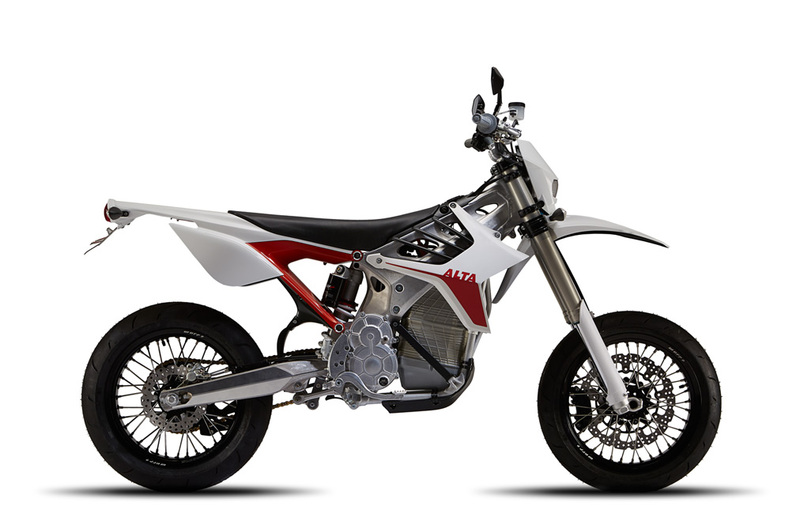 With that in mind, the horsepower number doesn’t quite compete with true 250cc MX bikes making 10-15 hp more, but without the need to shift, Alta is banking on its smooth, linear power delivery to help the electric rider keep up while the gas rider is busy with the left-side controls. Also, there are far less rotating parts between a rider’s legs on the Redshift, potentially allowing for quicker handling compared to a gasser. The Redshift also benefits from having a liquid-cooled motor. As we’ve experienced with some air-cooled electric motors, aggressive riding (also called fun riding) quickly brings the motors to their thermal limits, resulting in cutback and loss of power. Liquid-cooling should make thermal cutback less of an issue. What makes this feat more surprising is the lack of a radiator. “We have a proprietary system that’s patent pending,” says Marc Fenigstein, Alta CEO and co-owner, “and until that patent gets approved and published I can’t say any more about it.” Fenigstein went on to mention a design principle for the entire bike was reducing the amount of core parts necessary. “If we can make one part do the job of six, then we’re going to do it,” he said. Alta says the Redshift also features selectable power maps you can change on the fly, which will allow the user to fine tune, among other things: e-throttle response, the regenerative braking effect, and a “virtual flywheel.” Alta’s press materials also claim helical gear reduction, which, according to Fenigstein, is a single-stage gear reduction from the motor to the countershaft sprocket, placing the sprocket and motor in optimal positions. This should enhance the performance potential, especially in acceleration, as the Redshift, like most electric motorcycles, operates in a single final-drive gear. The Redshift SM is basically an MX with 17-inch wheels and bigger brakes, and can be equipped with lights, mirrors and indicators for road-legal use. Scrapping those components for competition use sheds about nine pounds from its 264-lb. weight. The 251-lb. Redshift MX carries a $14,995 price tag, while the 264-lb. 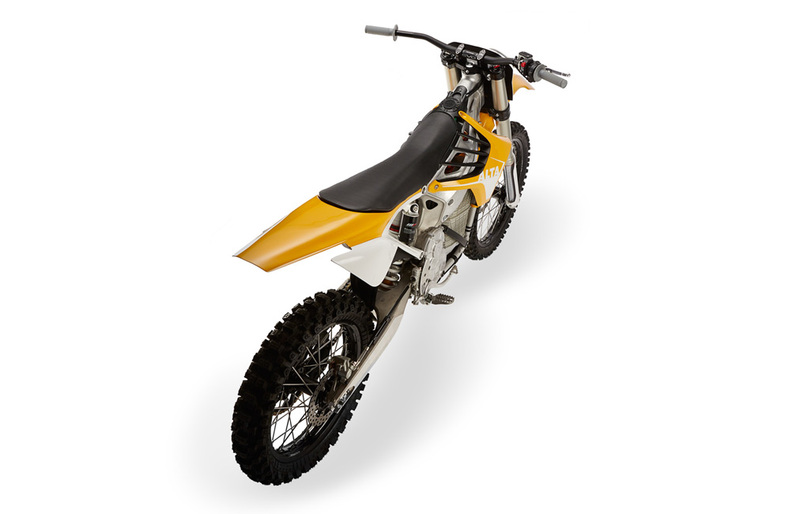 Supermoto version sells for $15,495. Both bikes will carry a one-year, unlimited mileage warranty, and Alta is selling its models exclusively through its ever-growing dealer network – it will not sell direct to consumers. Dealer deliveries are scheduled to begin in Q2 2015 in California, while the rest of the country will start receiving units in Q3. Motorcycle.com will get our hands on a test unit as quickly as possible, but until then, visit www.altamotors.co/ for more information and check out the video below to see what the Redshift can do. Trackside with the 2015 Alta RedShift Motocross & Supermoto test mule. from Alta Motors on Vimeo.